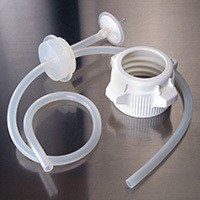 Note: 2-Port BioClosure Cap Assembles are supplied non-sterile. 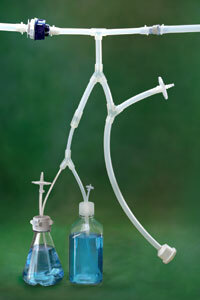 All 2-port, molded AdvantaFlex BioClosure Cap Assemblies are supplied with one (1) 1/4" I.D. x 1/2" O.D. AdvantaFlex vent line and one (1) 1/4" I.D. x 1/2" O.D. AdvantaFlex fill line. 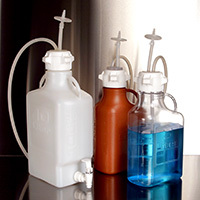 A non-sterile, 10 Liter, 3-Port Cap Assembly is part number AFCA3-83-1000-04. A gamma sterilized, 10 Liter, 3-Port Cap Assembly is part number AFCA3-83GS-1000-04. These 3-port BioClosure Cap Assemblies are supplied with one (1) 1/4" I.D. x 1/2" O.D. AdvantaFlex vent line and two (2) 1/4" I.D. x 1/2" O.D. AdvantaFlex fill lines. A non-sterile, 10 Liter, 3-Port Cap Assembly is part number AFCA3-83-1000-08. A gamma sterilized, 10 Liter, 3-Port Cap Assembly is part number AFCA3-83GS-1000-08. 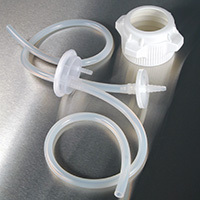 These 3-port BioClosure Cap Assemblies are supplied with one (1) 1/4" I.D. x 1/2" O.D. AdvantaFlex vent line and two (2) 1/2" I.D. x 3/4" O.D. AdvantaFlex fill lines. cap removal and attachment while wearing gloves. Carboys are available with or without spigots and have large levers that control two flow rates – one for continuous, locked flow and the other for faster, manual flow. The spout features 5/8" and 3/4" hose barbs and a standard internal luer tape to fit a male barb adapter. Additional options provide flexibility in drainage, pump connection and automated equipment. Spigot fittings are available as 1/4", 3/8", 1/2" and 3/4" hose barb adapters, as well as a 3/4" sanitary Tri-Clamp connector. 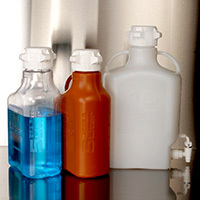 Carboy capacities range from 2.5 Liter through 40 Liter; not all materials are available in all sizes. Please contact your AdvantaPure Technical Sales Representative at 888-755-4370 (in the U.S.) or 215-526-2151 for more details.